Around 150 children are sponsored in Sri Lanka with the money going towards their education. Sponsorship money is spent on school equipment (eg. pens, paper and books) and extra tuition. Sponsor a teacher in Sri Lanka and pay their wages. Your money will make a difference and will bring a smile to every child who is sponsored. The sponsorship money helps pay for educational materials - stationery, textbooks, school equipment as well as transport to and from school for extra classes. In addition to this it helps to put food on the table for some of the poorest families living in some of the most remote communities. 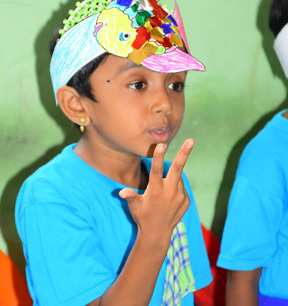 We have been supporting a school in the town of Vallaimanal since 2005. We are currently sponsoring approximately 100 children there. This area is remote and the people there were hit by the Tsunami and also the Civil War. The sponsorship money helps with educational resources and also with providing food for the families. Our team from the UK visit the school every year during their trip in October which provides great excitement for all the children. We currently pay the wages for over 30 teachers at our pre schools. They are all very dedicated teachers and often work in extremely challenging circumstances with very few resources. We provide them with an OceanStars sari every year which they wear with great pride. It costs £25 a month to sponsor a teacher. 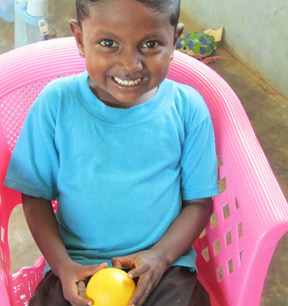 Kilmya, an 18 year old Mulsim girl living in Trincomalee has been sponsored by Anne since she was 7 years old. Kilmya has recently received excellent 'O' Level results and is now planning on going to University and studying medicine. The whole community is 'buzzing' with excitement at the prospect of having their own doctor. "If it wasn't for the sponsorship and support of Anne for the past ten years I wouldn't have been able to afford the extra tuition that has helped me to achieve my goal of staying at school and taking my 'O' level exams."